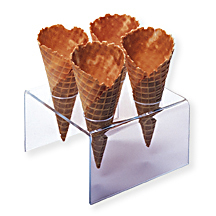 This waffle cone holder is a must have for your dessert station. It is made of acrylic and holds up to four waffle cones. This Waffle Cone Holder offers a Practical way to display your products. Made of clear Acrylic, this Countertop Pastry Display, Food Display is a surprisingly simple way to serve your customers. Buy Waffle Cone Holder now - Use our convenient shopping cart or give us a call and place your order with a knowledgeable service representative today!